Growth marketing for B2B is based on the techniques honed by “growth hackers,” who use data and experimentation to boost growth for internet startups. These data crunching experts are the marketers behind the huge growth rates at companies like Dropbox, Airbnb, Uber, Facebook and others. B2B marketers can borrow from the growth hacking playbook, and apply these principles to more traditional types of businesses. All it takes is a focus on data analytics and a willingness to try (and test) new approaches, whether you opt for incremental changes or major disruptions. Whether you’re a brand-new startup or a blue-chip multinationals, the goal is the same: boosting growth in terms of conversions and customers. Retention – do your users come back? Revenue – are you making money from users? Referral – do your users tell others? Then consider the data that you have on each metric. Also, consider the amount and quality of data you have. You may want to strengthen your ability to track and analyze data with a platform like HubSpot, which streamlines and simplifies the execution and analysis of your inbound marketing activities and campaigns. Acquisition: Are the right users coming to your website? Are the anticipated number of users visiting your pages, or do you need to increase the number of visitors? Activation: How successful are you at getting website visitors to sign up for your newsletter, or offer? Retention: This will really depend on the nature of your business. Are your customers renewing contracts? Are they ordering a second piece of equipment? Referral: How important are testimonials to your business? Are you customers willing to provide them? Are your customers recommending you to others? Revenue: Can you link the rise or fall of revenue to what you’re doing online? Now, choose an area to focus on with an experiment in growth marketing techniques. Where do you see potential to improve? Or which results are alarmingly poor? Perhaps you want to start with a small project, one that’s easy to execute and measure. Focus on a numeric goal, choose your tactics and watch the action closely. Do A/B testing to see how your ideas land with your targets. Each time you conduct a growth marketing experiment, you gain valuable data and insights. Even if your plan falls flat – if your numbers go down instead of up – you will have learned from your efforts. Information should be flowing both ways between marketing and product development. Whatever feedback you get should be funneled to your development colleagues, and ideally they keep you in loop about what products are coming. Want to learn more? 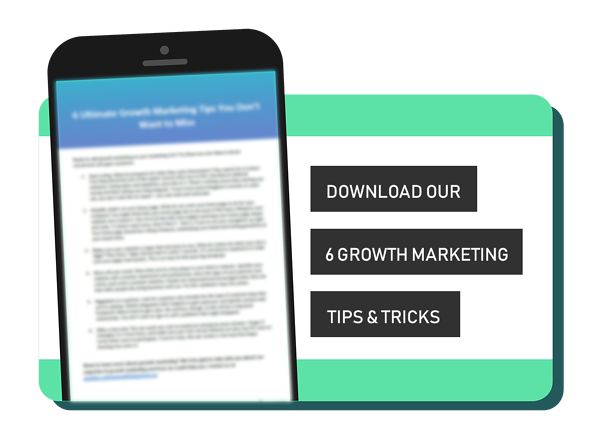 Download 6 Ultimate Growth Marketing Tips You Don’t Want to Miss and start using growth marketing to power your business.